Compact, yet extremely powerful pressure boiler, designed to produce large quantities of hot water and steam. It is easily installed with permanent mains connections to the water and power supply. 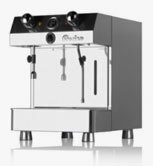 The Vesuvius has a specially designed hot water outlet to accommodate large tea pots and a steam tube, which can be fitted with an automatic steam frother. The Atlantis boilers are high volume hot water systems. The Atlantis has a 19 litre boiler, giving an immediate draw off of 15 litres of hot water and produces up to 108 litres of hot water per hour. Available with 3kw element (13 amp power supply) or 6kw element (30 amp power supply). 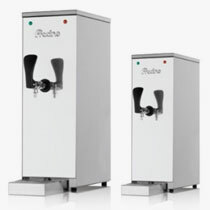 The Atlantis Mini is a 13 amp 3 kw mini water boiler. Suitable for smaller counter areas that require instant hot water at the pull of a lever and will producing up to 30 litres of hot water per hour.